With a staggering 39% of the vote, Terrell Owens was the "winner" of an SI.com poll among NFL athletes on the subject of the league's most annoying player. Owens was one of only two players to get into a double digit percentage, the other being Joey Porter with a disappointing 10%. More impressive, though, might be Carson Palmer's — excuse me, Anthony Wright's — back-up, Doug Johnson. The Bengals 3rd string QB cracked the top six in the voting with 2.3%. I wouldn't have guessed that 2.3% of NFL players would have even voted for Doug Johnson as an NFL player. To get that kind of a percentage while being that anonymous of a guy ... Well, Doug Johnson must work very hard at being a prick, much harder than he works at being a quarterback. It says here that the biggest knock on him at the time he was drafted was that he was "immature." I'm guessing that's an understatement. Either that, or he's the one guy on the Bengals roster who will say things like, "Hey, Chris Henry, you probably don't need to carry that gun into the shower with you," or maybe, "Chris, I was thinking that the huddle might not be the most appropriate place for a bottle of courvoisier." 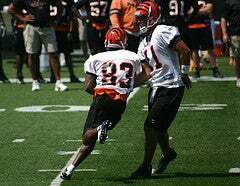 I could see a large portion of the Bengals roster finding that goody-two-shoes act annoying. It's also disappointing to see Fred Smoot on the list with 2% of the vote. He's really only annoying if you don't like things being shoved in you.